After almost 18-months of hard work by the employer Trailblazer group, at 2:40pm on Friday Nov 2nd 2018 the Institute of Apprenticeships announced the Level-4 Sales Executive Apprenticeship is now approved for delivery. So now just a few hours later, it’s our turn. 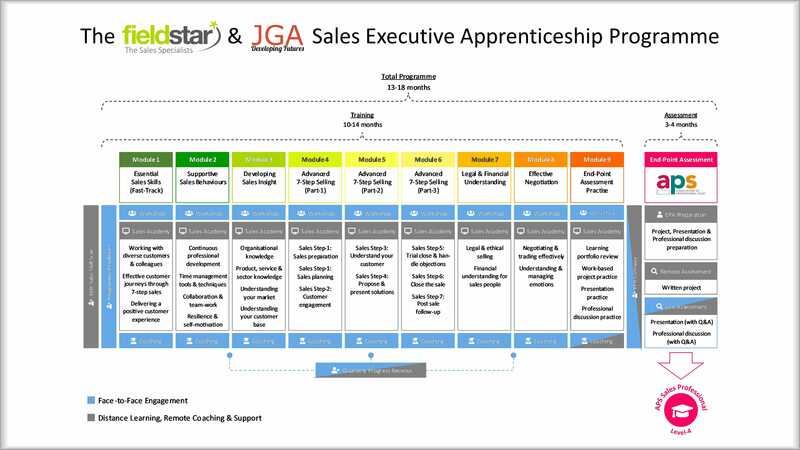 We are very proud to announce that FieldStar (the sales specialists) have partnered with The JGA Group (the apprenticeship specialists) to launch the UK’s first ever Sales Executive Apprenticeship programme. This rapid turnaround has only been possible due to our unique relationship with the Trailblazer group. FieldStar Founder Steve Radford has worked closely with the trailblazers throughout their entire journey, providing advice and support as they developed the apprenticeship Standard and Assessment Plan. This unique level of access, combined with FieldStar’s experience of developing sales training programmes for some of the world’s biggest brands and UK’s leading universities, and JGA’s experience of delivering award winning apprenticeship programmes, means we’re confident that our programme is industry leading in more ways than just being first to market. But we don’t want you to take our word for it, we’re ready for you to experience the programme yourself! For a quick overview download the brochure, or to see the learning journey in action and discuss how we can tailor the programme to suit your business and the individual needs of your learners, get in touch! Contact Steve at FieldStar (steve@fieldstar.org, 01302 742 744), or John at JGA (john.riley@jga-group.co.uk, 020 8426 2666).